The Slingbox lets you put your TV shows onto the Internet so you can watch them anywhere. The Slingcatcher does the opposite: it hooks up to your TV and lets you watch digital content from your Slingbox, your computer, or from the Internet. Compatible with standard and high definition TVs, the Slingcatcher lets you sit in your easy chair instead of your computer chair, and watch digital video over your LAN. Ever saw a video you wanted to share with everyone, but they couldn't all crowd around the computer to see it? Send it to your regular TV, then. How about that trailer for the latest movie? Kinda hard to see on your computer monitor? Watch it on your TV instead. Livecasts over the 'Net for special events? Put it on your TV. We live in a digital age; take advantage of ALL the digital media out there, not just the ones that fit on your DVD player. Universal Media Player for Your TV With the Sling Media SlingCatcher, access live or recorded video from your Slingbox, USB drive or PC and enjoy all of them on your big screen TV. 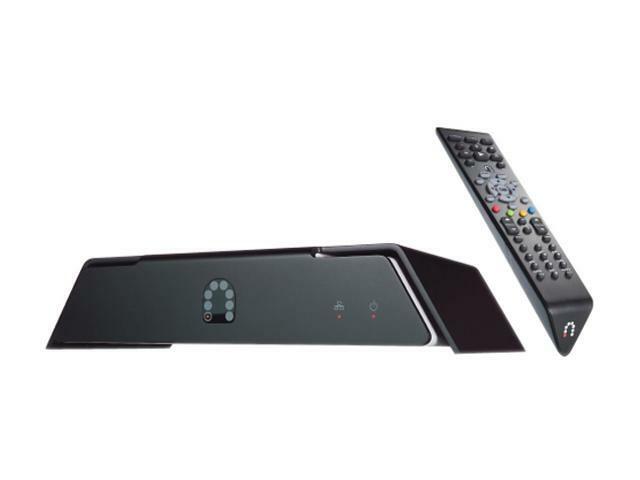 Easy Operate with Remote Control Control the Sling Media SlingCatcher as well as your TV, home theater receiver or any device connected to your Slingbox using the learning remote control. This item is covered by IsaacTronics Return Policy. Pros: This device plays just about every type of video file out there and does what it's supposed to do... stream from a Slingbox. It's probably my favorite gadget in the whole house. You can map to network drives (Dlink DNS-323 for example) and watch all the videos on it. Cons: It does not play DRM encrypted files. I would think that by now Slingmedia would have worked a deal with Divx, Cinema Now, Netflix, or Blockbuster to provide more content. Also, it will not stream directly from sling.com and requires the slingprojector software to do something like that. I think that they should have the ability to do this directly from the Slingcatcher and not have to use a PC. Other Thoughts: There is limited love for the Mac. I prefer to use the Mac and Sling does not always have the same features for that as the PC. For example the slingprojector software will only work on the PC. Cons: This IS NOT a plug&play gear as the manufacturer claims to be. I connected it as per the user's manual. Installed software. Fire it up and nothing. I troubleshooted my home network, Firewall, reinstalled. Tried on different PC's with different OS's I did every little thing you can think of just to end up with frustrations. Tech support NEVER replied to my inquiries. This is plain garbage to the fullest extent of the meaning of the word. Save some trouble and stay away from this company. They are nothing but scammers! Other Thoughts: Honestly, you're better off using online tv streaming. Other Thoughts: Sling exhibited every sign of a poorly executed company and the last straw was when tech support told me that they only provide live tech support for 90 days and after that, it is $30 even though in three months they never were able to resolve any of my issues stated above that would make the product usable. Yes, even though I opened the ticket three months ago, they won't take those tickets to closure because it is now passed the 90 days. How silly? Also, there is a converter for all your media files which advertises that it might be able to convert your media to SC compatible files. It wasn't a good solution for me since my existing media are already optimized for my playstation 3, AppleTV, and other media center devices. SC is the only device they don't work on and I am certainly not going to maintain two separate 500GB media libraries. Finally, the slingplayer on your computer works great and doesn't share any of the same issues. Cons: still no ISO support. Loves VOB, but who uses that to backup? Pros: It looked nice, and the interface was nice I guess? Don't judge a book by it's cover. Cons: The interface is nice but there is such bad functionality that it just completely cancels out any form of pleasure with this product. It won't load off the network like other media tanks, you have to install software that is proprietary to windows(I use linux and it doesn't work under wine) to project your computer onto the TV and then play movies. No problem though right? Just put everything on an external and then play it with the convenient USB. Well apparently the last episode of Lost Season 4 and the first episode of Lost Season 5 take 2 hours to load 20%, is it really hard to play something off of a harddrive without doing any transfer? Lastly even when I did use the software it was slow, which worked great in combo with the nice looking slow interface that the slingcatcher had to offer. Overall not a good buy. Other Thoughts: I ended up looking at other similar products and found out about Network Media Tanks, look into the HDX1000, EHP 606, and Kaifa EP6000B. They all run an embedded linux and work really well for playing off of a network, external etc. while satisfying most interface beauty. I ended up ordering the Kaifa after RMA'ing this load of junk. Pros: Better than a 2.4ghz video transmitter, as it doesn't interfere with your wireless network(if you have one) It lets you control the remote source since the slingbox has a IR baster. Cons: Remote is slightly awkward... But it does the job. Other Thoughts: I brought this to allow a 3rd tv (a 6 year old 24inch sony crt based set) in a spare bedroom to recieve and control my Dishnetwork DVR reciever located in another room. Its hooked up to a 802.11g wireless bridge and it has no problems running on my wireless network. I have not tried connecting this to a HDTV, therefore i cannot tell how good/or bad this would look on High Defenition set. - Slingprojector was a bonus - I didn't expect much. But it really does a nice job to send the contents of a web browser (for example) to the TV, such as YouTube or Hulu. Cons: - Very laggy in controlling the remote TV. Not really its fault - inherent in the network speed - but it certainly does reduce the user experience. - Remote control doesn't map great to a Directv DVR - there is no EXIT button for example, and the POWER button is overloaded such that you then have to tell it whether you mean to send POWER command to the remote TV/ SLINGBOX or just want to power off the Slingcatcher. Two separate buttons would have been a cleaner, more intuitive design. - You can plug a USB drive into it, but pretty much every format has to be converted first. It cannot even display just JPG files as a slide show. Other Thoughts: I hav two college age kids off at school. They have fast internet service, but no cable tv, etc. This allows them to connect to the DVR at home, and works quite well for them. They used to just do so via Slingplayer software on the computer, and very very occassionally go thru the hassle of connecting computer to TV. But this makes it much easier and nicer. Other than the inherent lagginess, I expect most of the little complaints I have about it will be improved with some firmware updates. And the box updates itself automatically. For a v1 product, (Yes, I know it was extremely late), its a good effort. After buying one, I did turn around then and buy a second - clearly I was impressed enough. Pros: I travel a lot - living overseas quite a bit. I have a superb picture quality at 1.5Mb/s to 1.8 Mb/s coming from a DISH Network receiver through a 2nd Gen SlingBox Pro using component video @640x480 resolution. I am truly amazed at the picture quality and stability of this device. I have 3 remote SlingBoxes (1 first Gen and 2 Second Gen SlingBox Pro's) so I will be purchasing more Sling Catchers soon! Cons: Unlike the SlingBox software, the program guide is not built in so you are reliant on using the slower guide on the remote DISH network box. Other Thoughts: Does not record, pause or fast forward unless you have this feature on the remote DISH network box, I would love to see this feature on the SlingCatcher via USB.